RCW 86 (also known as G315.4-2.3 or MSH 14-63) is a large (40 arc minutes in diameter) shell-type supernova remnant. It is located at a distance of around 2.5 kpc (7500 light years), so that its physical size is about 30 pc (90 light years) across. RCW 86 is of special interest as it is probably the remnant of a supernova event that was recorded by the Chinese in AD 185. 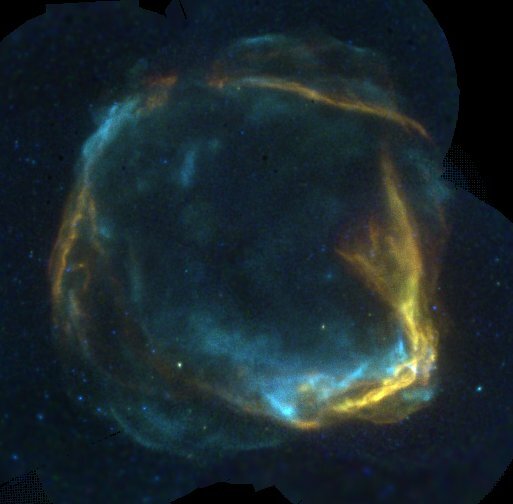 The supernova remnant has been well studied with radio, optical and X-rays instruments. Strikingly, at X-ray energies its shape changes dramatically when going from softer (<1 keV photon energy) to harder (>2 keV photon energy) X-rays. The softer X-rays are caused by emission from the hot gas in the shell; the harder X-rays are probably caused by synchrotron emission from electrons with energies of 10-100 TeV. This makes RCW 86 one of the oldest, or perhaps the oldest, supernova remnant with X-ray synchrotron emission. Like another famous TeV gamma-ray supernova remnant, RX J1713.7-3946, RCW 86 is thought to have been caused by a supernova explosion going off in a region emptied by the strong wind coming from the star before it exploded, which would explain both the large size and the high shock velocity that is necessary to explain the emission of X-ray synchrotron radiation. H.E.S.S. has observed RCW 86 before, resulting in a scientific paper published in 2009. Although the source was detected back then, its morphology could not be clearly established. Today, with more data on this source recorded, H.E.S.S. 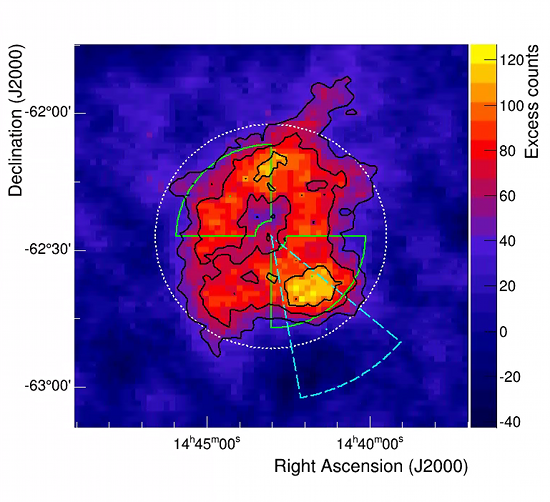 observations reveal the TeV morphology of the supernova remnant (Fig. 1). And indeed: thanks to the new data we are able to show that RCW 86 has a shell-type morphology in very high energy gamma-rays as well (Fig. 2). Moreover, the gamma-ray spectra of different regions can now be studied, and the overall morphology can be compared to the morphology of RCW 86 in the radio and two X-rays bands (Fig. 3). 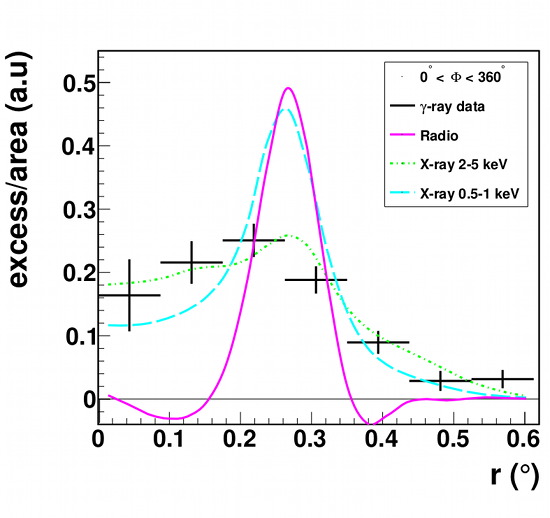 The analysis shows that the TeV gamma-ray shape of RCW 86 correlates well with the X-ray synchrotron emission, but poorly with both the radio and the soft X-ray emission. This is perhaps not entirely surprising, since both the hard X-ray emission and the gamma-ray emission are caused by particles accelerated to very high energies. Fig. 1: VHE gamma−ray emission of RCW 86. The sky map is smoothed with a Gaussian filter to reduce the effect of statistical fluctuations. Black contours correspond to 3, 5, 7σ significance. The white dotted circle depicts the integration region chosen for the spectral analysis. Both gamma-rays and hard X-rays could be caused by very high energy electrons, in which case differences in morphology need to be attributed to variations in the magnetic field. The average magnetic field necessary to simultaneously explain the hard X-ray and gamma-ray emission is then about 20 microGauss (2 nanoTesla). However, it could also be that the gamma-rays are caused by energetic protons colliding with the hot gas in the shell. This scenario requires a larger magnetic field, and a conversion of 10% of the supernova's explosion energy into energetic protons, assuming a typical ambient gas density of 1 atom/cm^3. Energetic protons as an origin of the gamma-ray emission thus cannot be excluded, but requires a spectral energy distribution of the protons that is harder (E^-1.7) than what is normally assumed (E^-2). Finally, the H.E.S.S. data show a clear steepening of the gamma-ray spectrum for energies in excess of 3 TeV, indicating that we observe gamma-ray photons caused by particles with energies close to the maximum particle energy. Reference: Abramowski et al. (H.E.S.S. Collaboration), Detailed spectral and morphological analysis of the shell type SNR RCW 86, Astron. Astrophys. (in press). Fig. 2: Radial profile of the spatial distribution of the TeV gamma-ray emission from RCW 86 (black crosses with error bars). 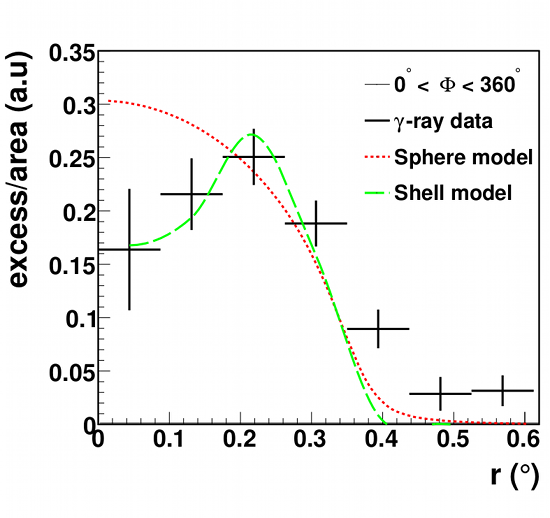 The dashed red line depicts the radial profile of a homogeneously emitting sphere, the green line that one of a shell-type source. Clearly, the shell morphology is preferred over the sphere. Fig. 3: (Scaled) radial profiles of the emission from the direction of RCW 86 at TeV gamma ray, radio, 0.5 – 1 keV and 2 – 5 keV X-ray energies. Black crosses depict the measured gamma-ray signal. The low-energy (0.5 – 1 keV, dashed cyan line) and high-energy ( 2 – 5 keV, dotted green line) X-ray data and the radio data (solid magenta line) are smoothed with the angular resolution of the H.E.S.S. instrument to account for the different angular resolution of the instruments. Radio data are from the Molonglo Observatory Synthesis Telescope (MOST), and the X-ray data are from the XMM-Newton X-ray telescope.